Before I joined the wonderful crew here at Banyan Hill, I commuted to work from my home in Northern Kentucky to my office in Cincinnati. As far as commutes go, it was fairly unremarkable … save for those autumn mornings with fog rising off the Ohio River in front of a sun-drenched Paul Brown Stadium. The Cincinnati skyline is certainly among the most beautiful I’ve seen, and you can get some of the best views by driving down I-75/I-71 heading into the city from the Bluegrass State. This is especially true at night, with the Bengals’ and Reds’ stadiums, Procter & Gamble’s headquarters, and the Great American Tower all decked out in lights and reflecting off the Ohio River. Unfortunately, this particular scenic view of Cincinnati comes at the cost of eventually having to cross the Brent Spence Bridge. The bridge has become infamous in the past decade as being one of the major pieces of U.S. infrastructure that desperately needs replacing. The Brent Spence Bridge was built in 1963 with the intention of supporting about 85,000 vehicles per day. It now handles more than 150,000 vehicles per day, with semitrucks accounting for more than a few of those. In fact, in 2011, President Barack Obama said the bridge was “in such poor condition, it’s functionally obsolete.” But the same can be said for a multitude of bridges, railways, roads, electrical power stations, etc., across the country. To remedy the situation, President Donald Trump has promised to spend $1 trillion to improve America’s crumbling infrastructure. If Trump follows through on this promise, it could be a lifesaver for Americans who regularly travel these roads, as well as offering up quite the “scenic view” for savvy investors. The fact that there are 50 such emergency and national security projects involving infrastructure is worrying all by itself, but the Brent Spence Bridge replacement is estimated to cost $2.5 billion in federal funds. And that is just one of the 50 projects that are estimated to cost, in total, $137.5 billion. 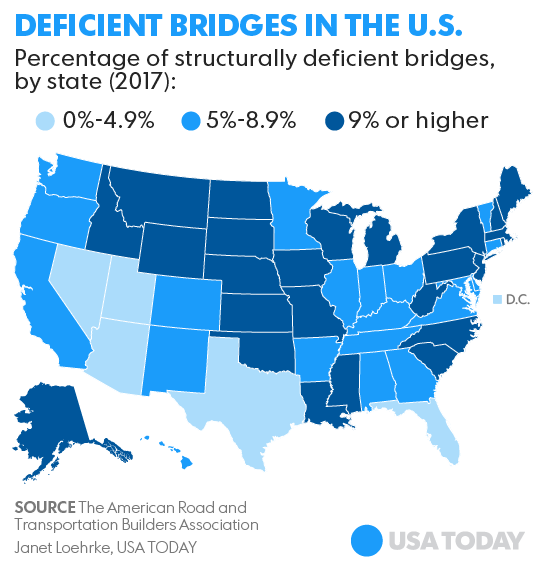 Not only is the Brent Spence Bridge just one of roughly 50 projects that have caught the White House’s attention, it’s also just one of the nearly 56,000 American bridges that have been found structurally deficient by the American Road & Transportation Builders Association. While Cincinnati is a smaller city, comparatively, high-profile bridges such as Throgs Neck in New York, the Yankee Doodle Bridge in Connecticut and the Arlington Memorial Bridge in Washington, D.C., are all major safety concerns and would cost just as much, if not more, to replace. If you’ve followed the news lately, you’ve likely heard about the developing crisis in Northern California. In February, the Oroville Dam’s emergency spillway failed shortly after a 200-foot-long, 30-foot-deep hole appeared in the primary spillway. Some 190,000 people live downstream of the dam. Also in February, the Twentyone Mile Dam in Nevada burst due to heavy rains, causing flooding in the region, damaging property and closing roads. There are plenty more “worst-case nightmares” just like these waiting to happen across the country. According to the Association of State Dam Safety Officials, roughly 2,000 dams in the United States were reported as needing repair in 2015. All told, it could cost upward of $60 billion to repair all the at-risk dams throughout the country, with nearly $20 billion of that needed for those with a high potential for hazard. Most of us don’t think about where our electricity comes from. We just walk in, flip a switch, grab the remote and turn on the TV. It just works. That is, until it doesn’t. We’ve been lucky in the U.S. Our aging power grid was largely a build-out of the Electricity Act of 1926 and the Rural Electrification Act of 1936. America’s current power grid consists of roughly 7,000 power plants, 55,000 substations and millions of miles of transmission lines. Until recently, this network was vulnerable mainly to weather disruptions, potential terror threats and squirrels … yes, squirrels. With the advent of the Internet of Things, a whole new security threat has emerged for our power grid, however. Substations and grid control networks are now all connected and managed via modern computer technology, putting them at risk of cyberattacks. Such attacks have already happened in Ukraine, and security experts believe the same could happen stateside unless security measures are ramped up. After reading how dams are going to burst, bridges will collapse and hackers are going to destroy our power grid, you’re probably ready to cower in your closet with a hoard of gold. While stocking back some gold is probably a good idea (for entirely different reasons), the infrastructure apocalypse isn’t going to happen anytime soon. All good investing advice starts with two words: Don’t panic. While I’m not putting all my eggs in one basket, Trump has promised to spend $1 trillion on improving America’s infrastructure. While reports have emerged that this spending may be delayed, Trump recently reiterated his promise to “start spending on infrastructure big,” and Congress seems more than supportive of the idea. If you’re looking for a way to invest in the betterment of America’s ailing infrastructure, companies such as U.S. Steel, Caterpillar and BHP Billiton are all prime candidates. But if a basket approach is more your style, look no further than the Industrial Select Sector SPDR Fund (NYSE Arca: XLI). The XLI took off like a rocket once Trump won the November election, rallying roughly 16.5%. 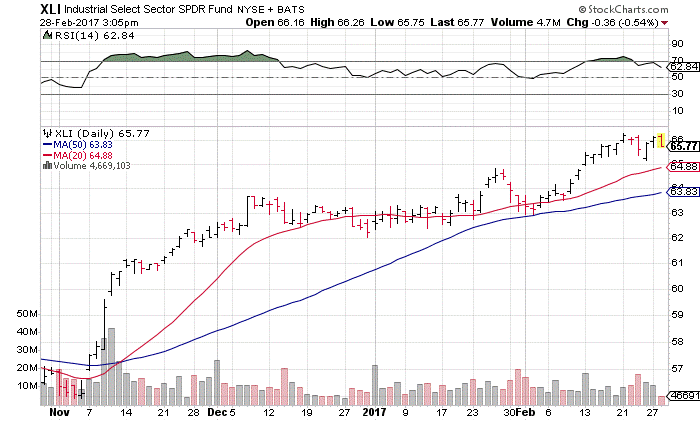 Throughout this uptrend, the XLI has maintained technical support at its 20- and 50-day moving averages, with recent support emerging in the $65 to $66 region. Even the recent scare about delayed infrastructure funding only pushed XLI down to its 20-day trendline before the shares recovered. With Trump not backing away from increased infrastructure spending, and more projects in desperate need of attention every day across the country, it’s only a matter of when the money starts flowing in earnest, not if. And with XLI currently in consolidation mode, now may be the perfect time to take a closer look at this exchange-traded fund.